My friends just stop and think a moment. Very few of you know why you're doing the things you are doing. Very few of you know where the customs that you follow and practice came from, whether ordinary customs in every day life or customs supposed to be Christian. Now, Christmas is supposed to be the chief of the Christian holidays. It's supposed to be a very strictly Bible thing that is enjoined and commanded on everybody, but is it? Where did it come from? Where did these customs start? Most of us just accept them, we assume them, we never question why. And then again we'll wind up with this, "Well, I don't see that it makes any difference anyhow." Are you sure? Now what does the Bible say about that? Does the Bible really have any authority today after all or does it mean anything? And is it just some empty writings of a little despised race of long ago in their search for God and they didn't know much about it and they never really found Him? Is that the real truth? Now, what do you think about it? Listen, write in for our booklet, The Plain Truth About Christmas, and we'll tell you what the Catholics themselves say about it in their own encyclopedia, where they got it, also, from many other documentary authorities. A carefully documented booklet, a very attractive little booklet, it will fit in a large size envelope; it will fit in your pocket, very easy to read, very attractive, not a cheap tract at all, on the Plain Truth About Christmas. It's about time you knew the truth, if you won't be offended. Now, if you will, just don't write in at all, if you're easily offended, because you may be offended at this, if you're easily offended, if the truth offends you, but this is the truth. Where did this thing of trading Christmas gifts come from? Most people think it came because the wise men gave their gifts to Christ, well, did it? I may say something about it on the close of this very program (I don't know if I have time), near the close, perhaps I shall; I'm going to on some of the programs. But if you want to know the whole truth about Christmas, read this entire booklet. There's no charge. If you're not afraid of having your eyes open, if you're not afraid of some surprises, and if you want to know the real truth, write in for this booklet on Christmas. There's no charge. I want you to go and get two things right now. Will you? Go and get an envelope with pen and ink or even a pencil will do, so that you can jot that down when I announce it again at the close of the broadcast at least I'll give you the mailing address again (I may not announce that booklet again; you better remember the booklet about Christmas) and so you can get that letter in the mail and write in for it and other literature that I am going to tell about which is absolutely free. At the close of this broadcast, get it in the mails immediately. Because if you put it off you're going to forget all about it and other things will crowd it out of your mind and then you won't get it done. The thing to do is to do it now. So, right now, get that envelope and pen and something else while you are at it (just turn that radio on a little louder, so you can hear it even in the other room), and also get your Bible and open it to the fifth chapter of Matthew — you're going to have some surprises. Why is it, my friends, that you have not heard the Gospel that Jesus preached? Listen, do people today, believe in what Jesus preached in the Sermon on the Mount. You've heard that was the most wonderful sermon ever preached. Do people really believe it's practical? Do they really believe in practicing what He preached there? You'll be ridiculed and jeered out of church and everything else today if you do, believe it or not? Now, let's see what Jesus did teach, and how many people today really follow it or really believe it all. Was Jesus just some kind of a four-eyed sissy that didn't know what He was talking about? Was He a molly-cottle or something or was He a real strong he-man? Was His teaching practical or was it just a theoretical platitude that wouldn't be very practical in every day life, now what do you think? Let's go into it and see. In the first place, the last two or three days we've been seeing that Jesus said He did not come to destroy the Law of God, which is God's way of life set in motion to give us peace and happiness and prosperity and everything that we all want. Today, they seem to think that way is wrong, they seem to think that Jesus nailed that way to the cross and that Jesus didn't like His Father's Commandments. Jesus said that He did not come to destroy the Law or the prophets. And do you know the New Testament Church is built on the foundation of the prophets as well as the apostles, Christ Himself being the chief cornerstone and Christ said He did not come to destroy the Law and that not the crossing of a "t" or the dotting of an "i" would be removed until all are fulfilling that Law? And in the New Testament we read that love is the fulfilling of the Law and that James says that we must fulfill it even as Christ did following His example, and that if we break one point of the Law, we're guilty. And to show us the points, he named two of the Ten Commandments to show that the ten points are the Ten Commandments. And if you break even one of them, you are guilty. And Jesus said, "Whosoever therefore shall break one of these least commandments, and teach men so, shall be called the least in the kingdom of heaven: but whosoever shall do and teach them, he shall be called great in the kingdom of heaven." Now, frankly, to me I had to consider what that meant, my friends. That meant that if I wanted to be lauded and considered great by men that I would have to break these Commandments and teach men to break them and that God had done away with them, because it seems to be popular, I don't know why but it is popular. And frankly, those of you listening to me now, more of you would look up to me and honor me and accept me and acclaim me if I would tell you that God's Law is contrary to your interest and tell you that God has done or Jesus did away with it and that you're free from it and that you are emancipated from having to obey God and you can do just what you please and try to kid you into thinking that you could have a clear conscience doing what you please and salve it over for you — I would please more of you and more of you would acclaim me but I would be called the least in the Kingdom of Heaven and I wouldn't even be there. Because sin is the transgression of the law and if I transgress it and teach you to do so, I'm not going to be there because no unclean thing shall ever enter into the Kingdom of God and I would then never enter. But if I do and teach them, I'm going to be very unpopular with a lot of you people listening. Now, each of you, does that mean you? How do you look on this thing? I'm making myself unpopular with you but I am going to be called great in the Kingdom of Heaven and I am going to be there. So, you know, I had to decide — do I want to be popular with men or I am going to care more of what God thinks. You know, that is the great problem that most of you have to face today. I know many people that come to see some of God's truth and they say, "Yes, now, I know that that's true." But the thing they don't say, that they are ashamed to admit is this. They know that if they begin to follow the way of God they're going to be looked down on and persecuted by men and they get afraid of what people are going to think: "Well, what would my folks, my mother, my family think? What would my former associates think, my former business friends and associates or my school chums and friends that I've known and been popular with, what would the people that I've known all my life and gone around with, what are they going to think? Oh, I'd be ashamed." And so, people go along the way with people and they care more about what people say than what God thinks. Is that your problem? Do you know why you're alive? Do you know is there any purpose for your life? Are you really getting anywhere? Are you happy? Have you found the right way of happiness? Have you found the way to make your life worth something? Are you fulfilling the purpose for which you were put here? You're going to face a judgment someday. And there you're going to scream and you're going to be frightened and you're going to face weeping and gnashing of teeth if you care now what people think about you and don't give a hang about what God thinks. You think God has gone way off somewhere, that God isn't even looking, that God isn't concerned, that He doesn't care? Let me tell you something, my friends, God Almighty created not only this earth, but the forces, and the laws, the energies, the powers, the forces that move matter on this earth. And God Almighty sustains them and God is the one who directs them and who controls them and God is a living present ruling force. God is the Ever-Living and He is the one who sees and knows everything you do and everything you do is taken to account and nothing is hid that shall not be revealed. And you're going to come that Judgment and how are you are going to fare then? It's about time we began to wake up. Listen, if you are going to follow the way of God, you will be persecuted, of course, you will because your Bible says, if you'll open it up and read it, that "all who will live godly in Christ Jesus shall suffer persecution." Now, that comes from other people but you don't need to suffer from own guilty inner conscience. You don't need to suffer these things that are of your own doing and cause others to suffer because when you break the laws of God and you go the way of this world you're not only making yourself suffer, you're bringing suffering on others. And the only the reason that anybody is suffering in any way on this earth is because people are breaking the laws of God. When will we wake up and realize that? Oh, I tell you my friends, I don't have very much company in telling you these things. God says, "Cry aloud, and spare not...and show my people...their sins." But there aren't many preachers that want to do it because it isn't popular. The people say, "Well now, we want peace and we want love and we want a preacher that will just preach the soft and smooth things to us and make us feel good. We don't want someone that's going to upset us and make us see that we're doing wrong and try to get us all upset now. We want someone that will show love and kindness and be nice to us and make us feel better and make us feel that the way we're doing is alright and then we are all uplifted and inspired and we can get all these things that are troubling our consciences off and we can go around and feel better." Oh yes, you think you can? Now, if I do that, how long are you going to feel better? I'd just be in plain language, just kidding you along and that's what a lot of people have been doing to get your money, my friends. You don't hear me ask for your money on the air, do you? And when you write for this literature, let me tell you something, there will be no request in this literature or otherwise for money and yet this a work of faith and I don't have a cent of my own to go on at all. We look to God and we trust Him. But you have never heard us beg for money and you have never found any request for money in the literature that we send you. People will say, "Well, you write in for literature on that program and you'll find out. They'll just dun you and they'll beg you for money." Well, are you going to believe the enemies of this work that persecute it or will you believe me? There is no request for money in any of this literature, not any whatsoever. We'll even send you a subscription to the Plain Truth, the most unusual magazine you ever read. And there is no subscription price and there is no begging for money in it of any kind, directly or indirectly. I mentioned to you before, that when I was starting out on this present Work, this present campaign, I'd been preaching about five years before that. But at that time that is when this Work started that has continued on and on and on and has not stopped until it now it goes almost around the world, and how the man said that we wouldn't get very far because people would not support the plain truth of the Bible. He says, "You preach just what the Bible says and", he says, "people don't like it." Do you know why, my friends? Because you read over here in Timothy, Paul's letter to Timothy, that "All scripture is given by inspiration of God, and is profitable for doctrine, for reproof, and for correction, and for instruction in righteousness." People don't want to be instructed in righteousness. And above all they don't want any reproof or correction. And they don't care too much about real doctrine, they want their own ideas and to do just what seems right to them. And then they wonder why they have all these heartaches, these headaches, these frustrations, these fears and worries and why things aren't working better out for them. Well, that's the very reason because they want their own way and they aren't willing to find the right way that would make things work out right. Well, there you are. Now, Jesus went on to magnify the laws, I was covering in yesterday's program. And He said, "You have heard...of old time, Thou shalt not kill." Then He went further and said that if you're just angry with a brother, that is the lack of love. Now, killing violates the law of love. And if you just have a lack of love for a brother till you're angry with him, you're in danger of the Judgment. "And whosoever shall say to his brother, Racca, shall be in danger of the council:" Racca means a sort of calling him a vain fellow in a spirit of condemnation. That implies, it's a Hebrew word, that implies that you're condemning the other fellow. "Whosoever shall say, Thou fool, shall be in danger of Gehenna fire". And the original word is not hell, but Gehenna in the Greek language, which was a place of burning, the valley of Hinom on the south bank of the city of Jerusalem where the bodies of dead animals and, well, garbage and all that sort of thing was thrown over the bank and burned up, completely burned up, until it didn't exist any more. Then Jesus said, verse 27, "You have heard it said,...Thou shalt not commit adultery:" back in Exodus 20, verse 14. "but I say unto you, that every one that looketh on a woman to lust after her have committed adultery already with her in his heart." He carried it further than the literal act. He carried it further than merely the letter of the law and over into the broad principle involved. 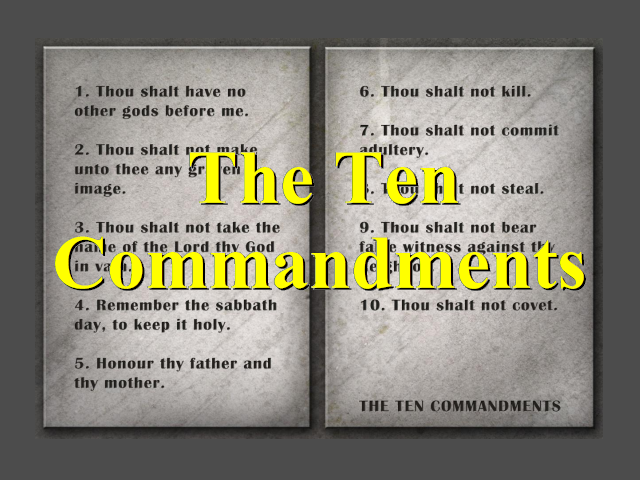 So that the Ten Commandments, my friends, when you magnify them and see them according to the broad principles that they cover, the Ten Commandments are a complete Law that cover every duty of man towards his God and toward his fellow neighbor. The Ten Commandments in principle cover every duty of man in his relationship with God and in his relationship with his neighbor. Every possible relationship is covered in the Ten Commandments. Your relationship with father and mother, your relationship with your children, between children and parents, the relationship in the family, the relationship between you and your next door neighbors, your relationship even with the government, your relationship with any and everybody, every relationship in principle is covered in the Ten Commandments. Advertisement Herbert W. Armstrong will return in a moment but first, this offer concerning literature of related interest. For a clear explanation of these principles, request The Ten Commandments. This free booklet shows how all ten of these time-tested principles can benefit you. Be sure to request The Ten Commandments. Your copy is free of charge. Just before I came on the air, my wife showed me an article that she had seen in a magazine. (Somehow I hadn't caught it yet.) And it was of a religious leader representing a certain religious sect and what they believe and oh my, how unhappy the man looked. What a very sorrowful, gloomy, downcast look he had. He was trying to please God by making himself miserable and unhappy — that doesn't please God. God wants us to be happy. You know, God wants us to be filled with joy, and with...well, just enjoying life, clear to the full. The thing is though we do a lot of things that give us a temporary sensation, a temporary kick out of life and then they boomerang, they react to make us unhappy tomorrow. Now, God condemns all that sort of thing because it's just a bad bargain, you pay too much for it. You get it now and you pay later and sometimes you pay for all of your life and some people pay with their lives. Some church people say, "Well, we want a preacher that will preach what we want. We don't want him upsetting and disturbing us and sending us home all disturbed and our consciences hurting." No, they don't want to repent and get right in the way that will let them be happy. They kid themselves and think they'll be happier if their preacher will preach the soft and smooth things and do away with the Law of God. You'll find it back in the thirtieth chapter of Isaiah — God foretold that that's the way people would be in these days in that prophecy, in the thirtieth chapter of the book of Isaiah. Well my friends, this is not the kind of program where you're going to hear that sort of thing; but I'm going to show you the way that you can be happy if you really want it. But you know, I guess we have to price — it is like trying to eat your cake and have it too. There is a way to happiness and God says, "The way of peace [my people] know not." We don't know the way of peace. We don't seem to know the way of happiness. Well, you listen to this program and little by little you'll get more of it every broadcast and I am pointing it out to you. It isn't a popular way. It isn't a way that your preacher even probably will like, I don't know about that. Although, a lot or preachers write in, they begin to see what I am telling, and thank me for it and I hear from people all over the United States say that their preacher is beginning to preach these things now and for that I am very thankful and very happy. But some of them don't do it; they just get angry and go on the way they've been doing. Well, it's a matter of whether we're going to serve God or serve man. I'm not going to trouble you anymore now. But I tell you, you better be troubled now rather than in the Judgment that you're going to face and have your life taken away and when you can find real happiness and peace and live forever if you will put your life in God's hands and trust Him with the result, He'll work out your personal problem for you. But can you trust God or do you think He's gone way off and isn't interested? God is interested in you. He's very much interested in your life and He will work out your personal problems if you'll put your life in His hands, if you will obey Him and trust Him with the result. Listen, my friends, I'm speaking to you from a rich life of experience. I've been doing that now for a good many years and before I did it, I was very ambitious trying to make a big success and all I met with was frustrations and unhappinesses. Sure, I made a lot of money when I was a young man. I started out pretty big. I was making a lot of money for a young man. I had an office in the loop of Chicago for a good many years. I was considered a rather brilliant young man in my profession; I thought I was somebody but I wasn't happy. I sought after all this world's pleasures and amusements and entertainments. They left me empty. I wasn't happy. But when I placed my life finally in God's hands and I felt it was worthless and I wasn't giving Him anything and I said, "If you can use it, take it and use it, it's yours, I was through with it." And I meant it and I have left it in God's hands as best I could ever since. Well, God has used it and there are thousands of you that He has used to change your lives because I did that. But let me tell you something, my friends, I found the only happiness that I ever knew. And I've found that there is a happiness within in spite of the persecution without that you can never know any other way. And I've found that if you trust God with the result, He may not work it out the way you want. He may not work it out as quickly as you would like, but He will work it out and way beyond your wildest expectations if you will trust Him with it. Can you trust God or do you doubt Him? Well, let's get on with this. "Again, you have heard it said of them of old time, Thou shalt not foreswear thyself, but shall perform under the [Eternal] thine oaths. But I say unto you, Swear not at all, neither by heaven, for it is the throne of God, nor by earth, for it is the footstool of His feet; nor by Jerusalem, for it is the city of the great King. Neither shalt thou swear by thy head, for thou canst not make one hair white or black." (A lot of them are trying to do it today aren't they by dyeing it — that's only a color put on the outside but you can't change the pigment. You can't change the actual hair.) "But let your speech be, Yea, yea; Nay, nay: and whatsoever is more than these is of the evil one." If you can only be relied on to tell the truth when you are under oath, it means that the rest of the time everybody considers you're liar and you consider yourself that you are. Listen, do you know that reliability is the main characteristic of God Almighty. If God is not reliable, if His word doesn't mean what it says, if you can't depend on His word, there is nothing in all this universe that any of us can depend on or rely on. Now, we were made to become God. We were made in the image of God. We're given some of the God powers. But we're given a mind independent of God to go right or wrong as we ourselves elect. And one of the most important things in developing the character which is the very purpose of your being here is that your word means what it says and that you can be relied on. Let your "yes" be yes and your "no", no and anything more than that is certainly of the evil one. Now, Jesus quoted that from back here in Leviticus the nineteenth chapter. In the eleventh verse, it's speaking about one of the Ten Commandments — stealing. And in the twelfth verse, "Thou shalt not swear by my name falsely," God said, "neither shall thou profane the name of thy God: I am the [Eternal]." Now, there they were permitted to swear but just as long as they didn't actually break the letter of the commandment against taking the name of God in vain, "thou shalt not profane the name of thy God", in so doing. But now Jesus goes a little further. And He says just let your "yes" be yes and your "no" be no and anything more than that is wrong. Now, I have been practicing that a good many years. And when I go before a notary republic or any place of the kind and they want me to hold up my hand and solemnly swear. I do not swear. The law does not require, the law permits you to say that I merely affirm that that's true and that's all you need to say and that's perfectly legal. If you're in a court, you don't have to hold up your right hand and say, "I do. I swear." The law says you can just merely affirm, you can obey God in that and there was a time when the laws of the land didn't permit it. I'm very happy that they do now. Now, listen. If you were to attain to the glory that is your potential destiny, to really fulfill the tremendous purpose for which you were put here on this earth, you must not only surrender unconditionally to God in real repentance and receive Jesus Christ as personal Savior, you must be changed, converted by continual overcoming and by growing in grace and the knowledge of our Lord and Savior Jesus Christ. You must, as Jesus Christ said, actually live by every word of God — that is by every word of the Bible. The very first business of your life, ahead of everything else ought to be the study of your Bible. You need to enroll for the Ambassador College Bible Course by correspondence and study it in your own home. I am quite sure that you have never seen a Bible study course that will even compare with the Ambassador College Correspondence Course. First of all, it will take you through those vital prophecies revealing our tremendous world upheaval present and what now lies on immediately ahead in this world. It will make plain to you the purpose that God is working out here below. You'll see it in your own Bible. It will make clear such subjects as salvation, the original creation, all doctrinal questions. But the one textbook is your Bible and you'll have to be willing to devote sufficient time to really study it if you hope to fully comprehend and clearly understand it. And remember, this is non-denominational.